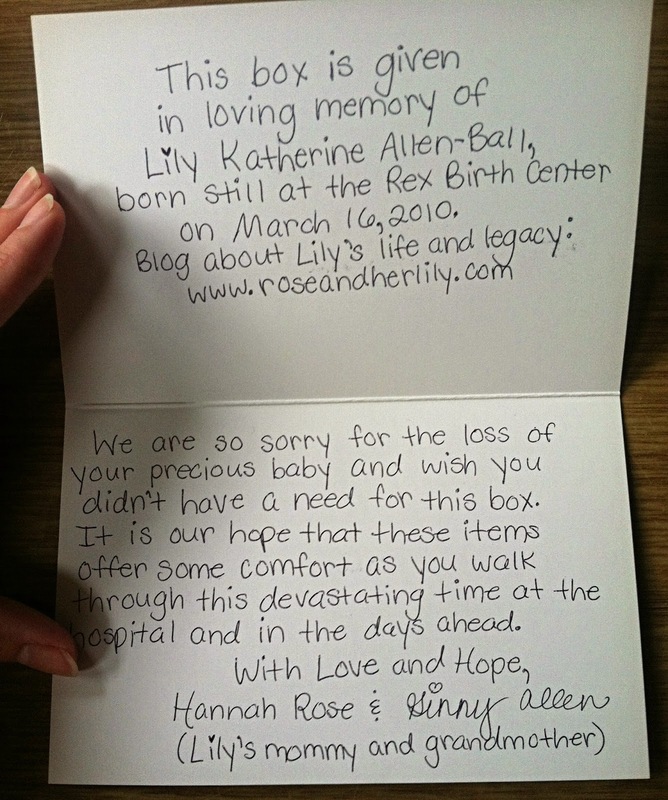 For a few years, I have been working on babyloss comfort boxes to be given in honor and memory of Lily Katherine to the Birth Center where she was born. This has been a project for my mom and I to do for our Lily girl. My mom supported me in many ways in bringing this dream to a reality. I didn't just want to get random things to fill the boxes, but carefully and lovingly selected each item over a long period of time. Every few months, as I decided upon something, I would order it online or purchase it when I saw a good deal or had a coupon at Michaels or somewhere. There were so many options and so many things I would have loved to include, but I did my best choosing the items I find most important and special. 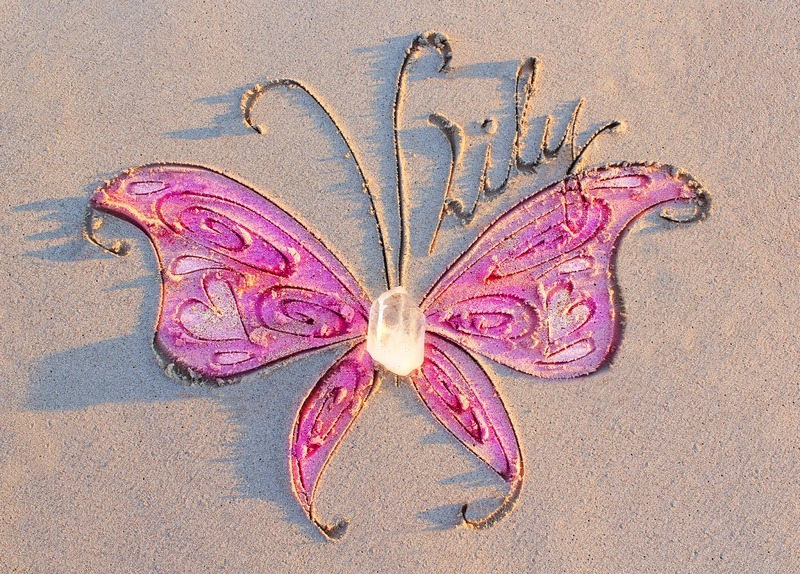 I considered what I would have appreciated having when I first lost Lily. My desire is to provide the information to help unprepared families make the important decisions while in the hospital, in the first hours after their loss, choices that later will not be regretted. I partly want to do this because of my own regrets and because I want to share the things I am thankful to have. I also want to provide the families with gifts to honor their little ones and other special items to help them heal in the days after leaving the hospital. I wasn't sure how to go about giving these boxes, who to contact about it, etc. I have heard of others trying to give similar boxes to their local hospitals and being rejected. I guess part of why I hadn't done it yet is because I was afraid of being rejected. God worked it out for me to get in contact with the sweetest lady who is a nurse at the Birth Center. She set up a time with me to bring the boxes on Lily's birthday. I had shared with her what would be in them and she set up a meeting in a conference room at the hospital for me to share my boxes! I was also able to bring red-velvet cupcakes for the L&D staff. I want to share the boxes to keep a record of it for myself and to hopefully inspire others who want to create similar boxes. If you are interested in making something for your local Hospital, call the L&D floor, the Chaplain, or someone else who can assist you. I am thankful that the staff at the Birth Center where Lily was born are so amazing and want to help the families who have lost babies in whatever way they can. I wanted the boxes to be simple and sweet and appropriate for both genders. I found the boxes themselves at Michaels and then my mom and I chose lace, ribbon, and little butterfly embellishments to dress it up a bit. I wanted it to have a personal touch. Here is what the inside of the boxes looks like. 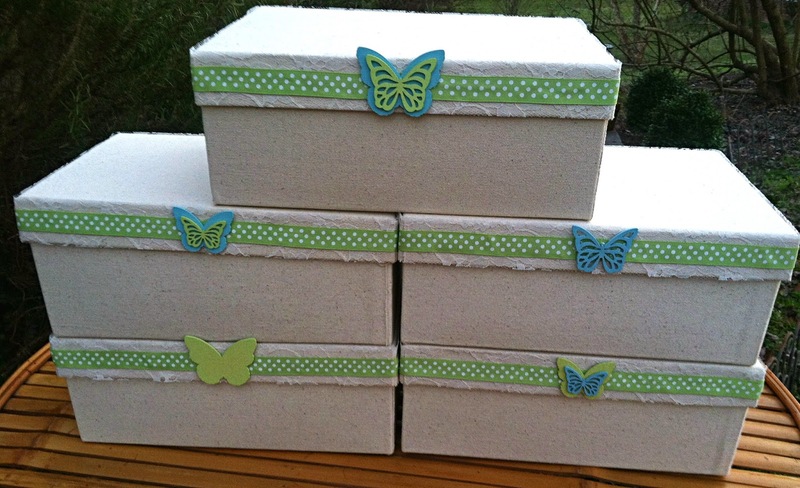 I wanted the boxes to have a "butterfly theme," so you will notice butterflies throughout. Butterflies symbolize new life, and our babies have new life with Jesus. 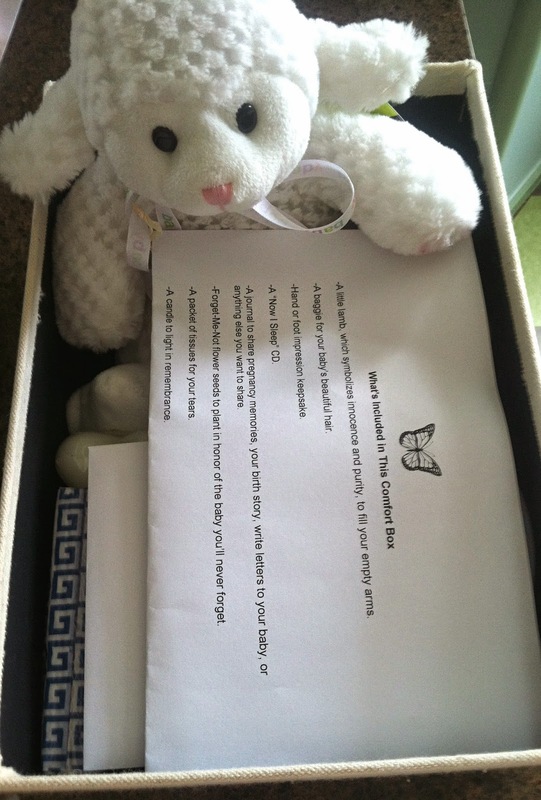 I included a page called, "What's Included in This Comfort Box," with an explanation for each item. 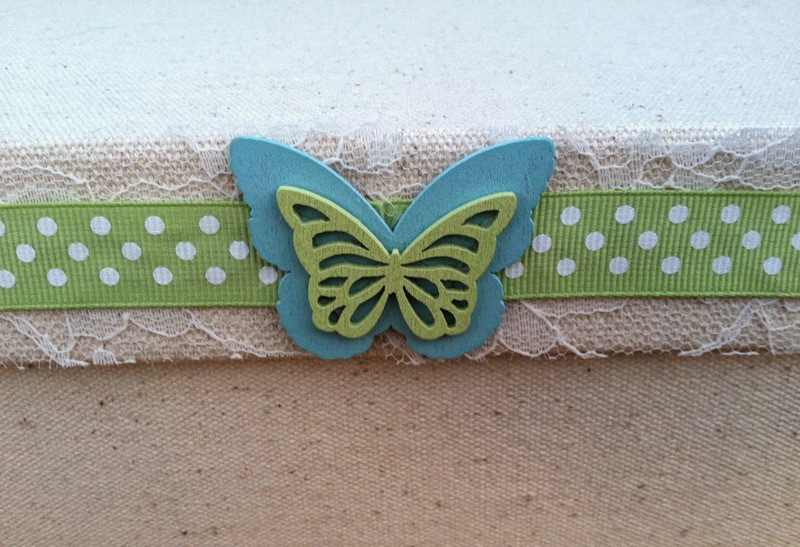 As soon as the box is opened, the page is on top, along with a special card underneath with a butterfly stamp on it. I got these special heartfelt sympathy cards for the boxes, specifically made by Lost for Words Card Line for babyloss comfort boxes. Again, there is a butterfly. This is what I wrote inside the cards. I wanted the personal touch of a handwritten note, and of course had to include who the box is given in memory of. -A little lamb, which symbolizes innocence and purity, to fill their empty arms. 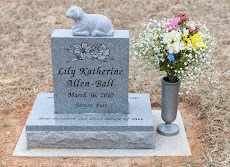 Lily and Katherine both mean "pure and innocent," and Lily's stone has a lamb on it, so lambs are quite significant and special to me. 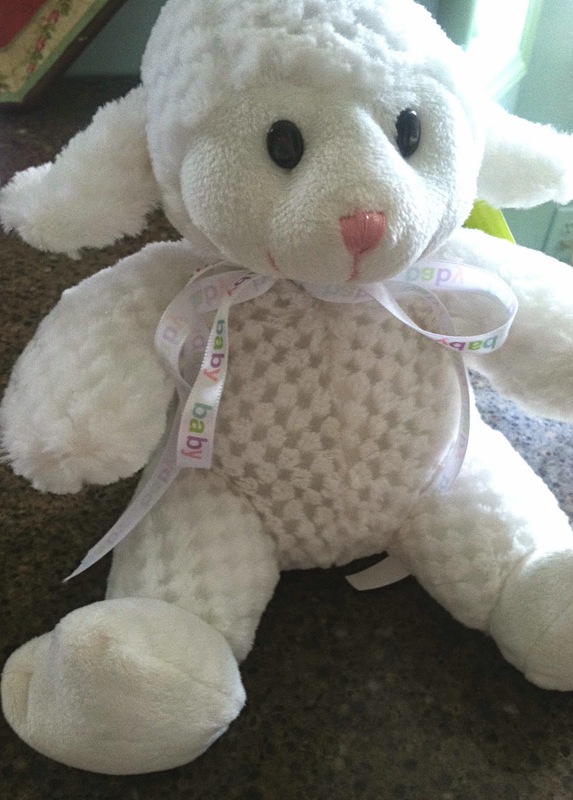 And a little lamb is perfect for any precious baby. My mom and I selected a ribbon with the word "baby" on it in many colors to dress up the lambs. I found the lambs at Tuesday Morning and the ribbon at Michaels. 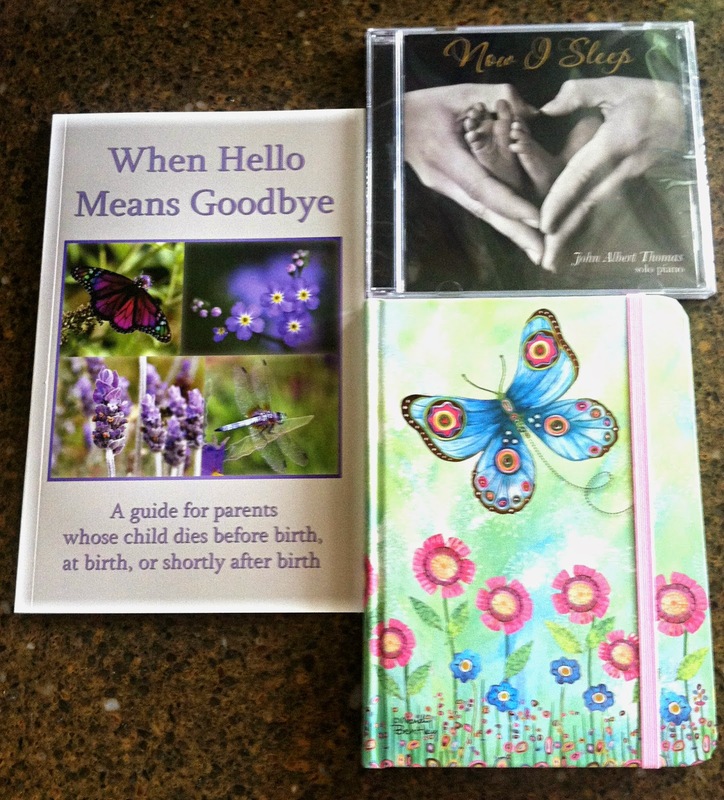 -A copy of “When Hello Means Goodbye” to help them make important decisions and to bring comfort in the days ahead. I encourage them before leaving the hospital to read the pages about seeing and holding their baby, taking pictures, and gathering keepsakes. Also, I mention that the sections on decisions to be made, autopsies, funeral homes, burial or cremation arrangements, and memorial gatherings are important as well. I tell them that I know that it will be painful and difficult to even think about these things, but I urge them now to consider all their options. I think some people who unexpectedly lose their baby are in a state of complete shock, which is why I want to "think for them," and help them do things that they don't realize how important those things will become to them later. I stressed this to the nurses when presenting the boxes, to make sure they understand the importance of this. I got these books online at "Grief Watch." -A “Now I Sleep” CD, which is a beautiful piano instrumental CD, specifically made for babyloss parents. The artist is a man named John Albert Thomas and he has generously worked with me to provide the CD's at a discounted rate. 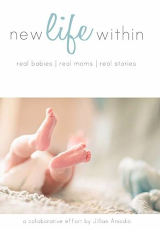 -A journal to share their pregnancy memories, birth story, write letters to their baby, or anything else they want to share. The journal has a butterfly and flowers on it, both of which remind me of Lily. Writing has been a huge part of my grief and healing journey and therefore I hope to encourage others to write as well. I found these journals for a great price online. -A baggie for their baby’s beautiful hair. I put a tiny plastic bag inside the baggie for a snippet of hair, so it doesn't get lost. I got both the baggies and plastic bags at Michaels. 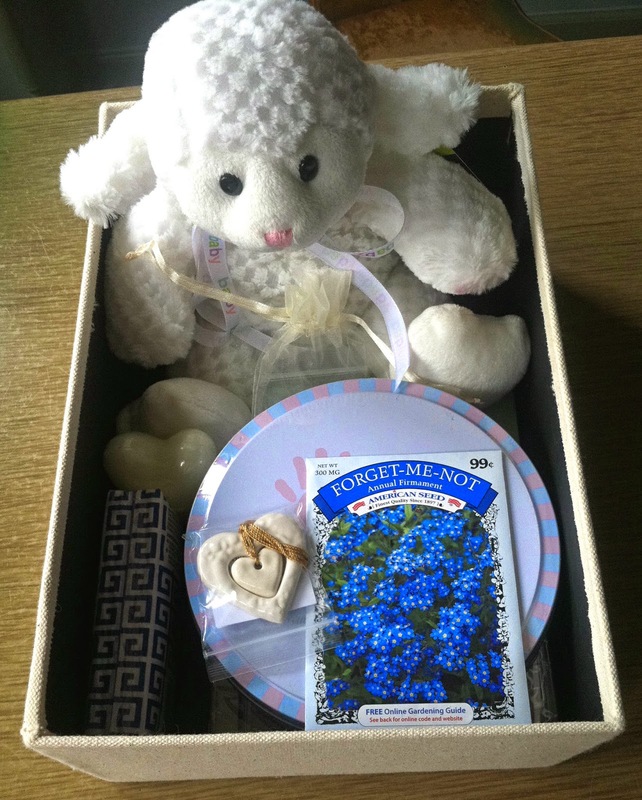 -Forget-Me-Not flower seeds to plant in honor of the baby they’ll never forget. I'm sure these can be found at many stores. -A packet of tissues for their tears. Again, these can be found at many stores. -A “Remembering Heart” necklace, which has two parts, the tiny inner heart can be kept with their baby for burial or cremation and the outer heart can be kept or worn by the mother or father. This is such a special way to have that connection with their child. Many parents later wish they had done something similar. I got this necklace online at "Grief Watch." -A heart candle to light in remembrance. 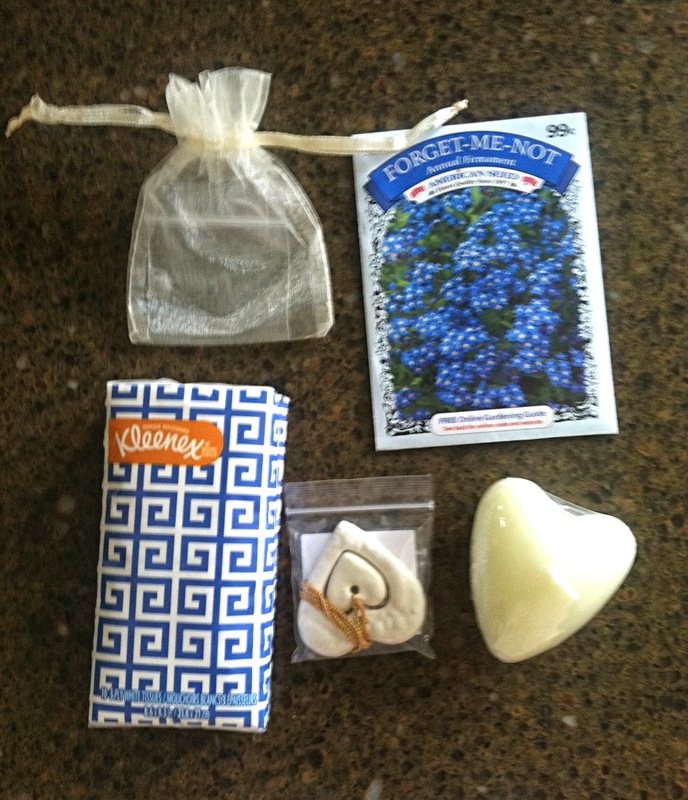 I can't remember specifically where I got these, but similar small candles can be found at many stores. 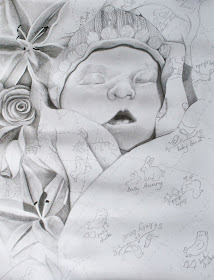 -A beautiful art card specifically for such comfort boxes from the lovely Stephanie of Beyond Words Designs (her daughter Amelia was also born sleeping, just five days before Lily, on March 11, 2010). Stephanie is one of my favorite artists. 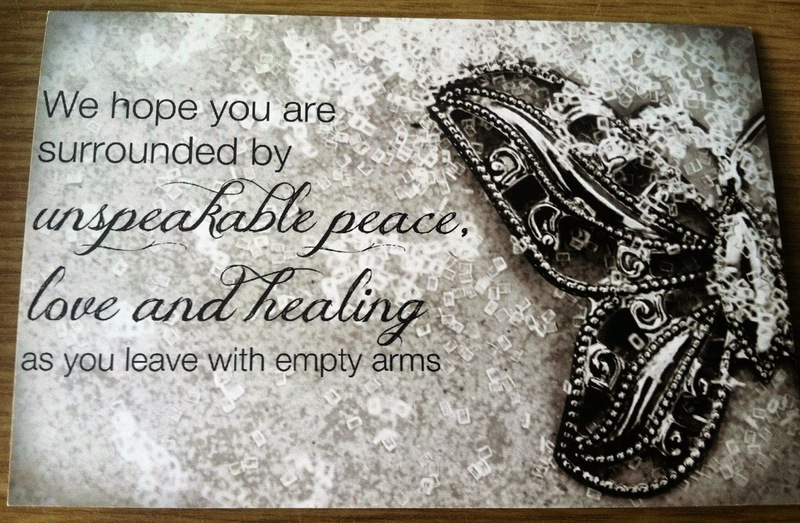 This card can be framed, included in a scrapbook, etc. Stephanie generously donated these. 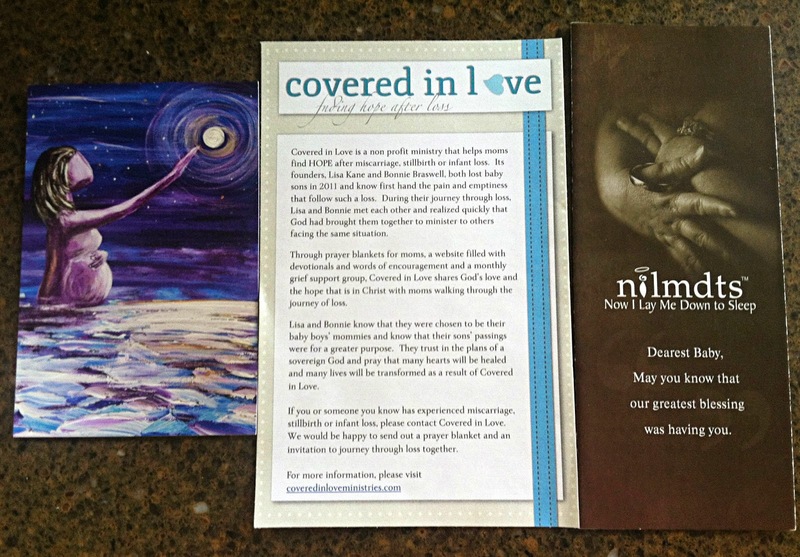 -Information on one of the local to Raleigh infant loss support groups, Covered in Love. 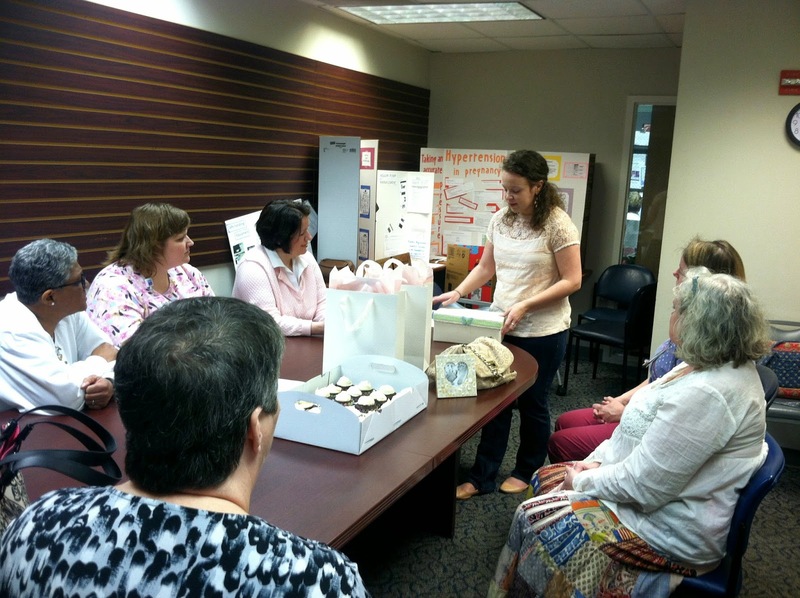 I also included information on another local to Raleigh group, ParentCare. -A Now I Lay Me Down To Sleep brochure. This is one thing I wish with all my heart I had known about! I got these in bulk directly from NILMDTS. 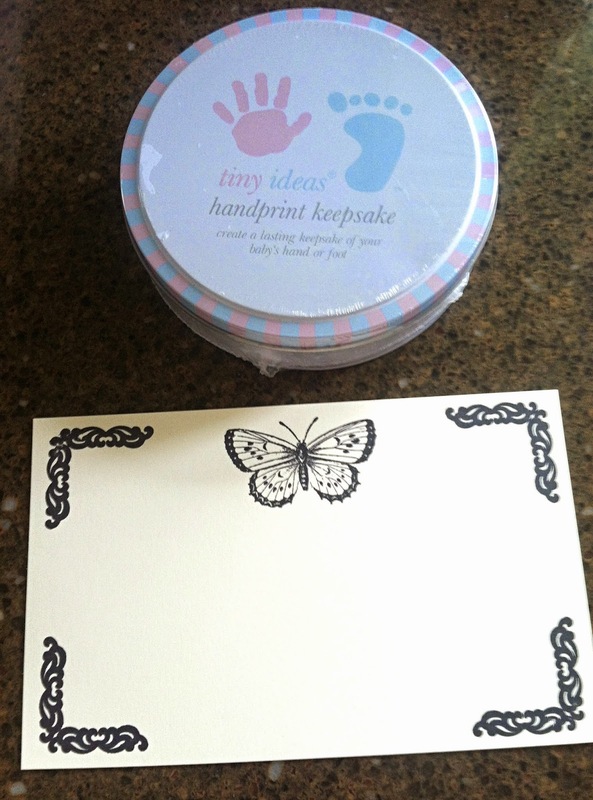 -A keepsake impression kit for baby's hand or footprint. I found these at T.J. Maxx. I'm sure similar things can be found online or in many different stores. 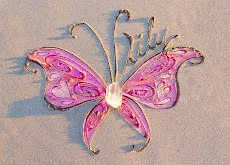 -Special butterfly cards (one for handprints and one for footprints). I created these myself with papers and stamps I found at Michaels (I made sure they were acid free). 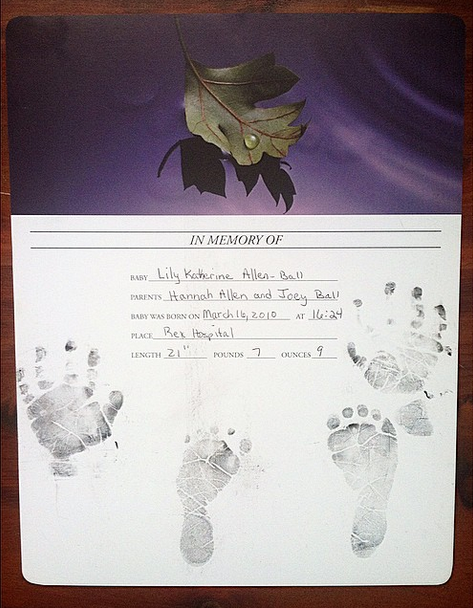 I want to encourage the families to get more than one set of original foot and handprints, for grandparents and other family members, or just to keep for a scrapbook, etc. This is one thing I really wish I had done. 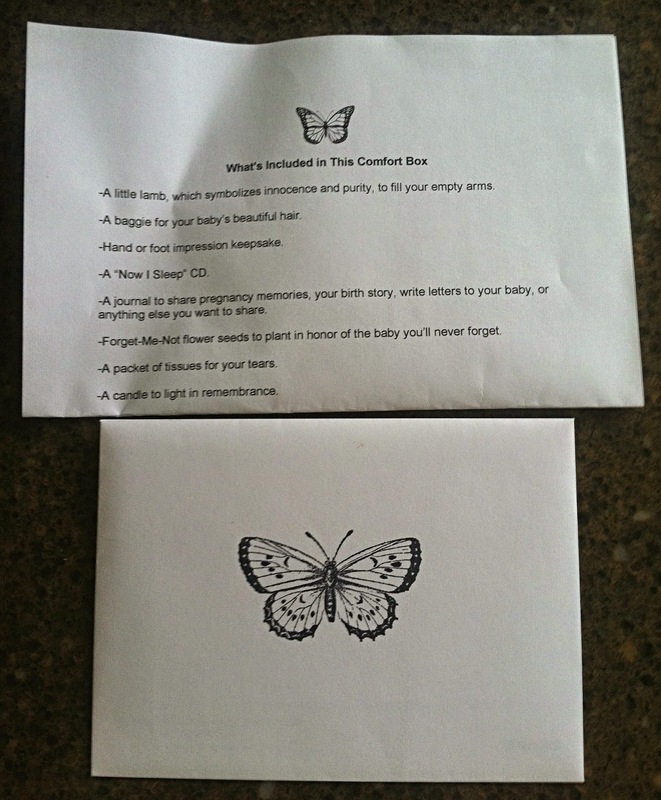 Also, I wanted them to be able to have their baby's prints on beautiful paper (again, the butterfly theme). The only original set of Lily's prints that I have is on a paper with the leaf with the teardrop. 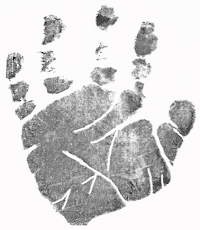 It's such a sad and painful symbol to me, so I don't want them to always have to see that when they look at their baby's prints. It is a common symbol used in hospitals to alert doctors and other medical professionals that there has been a loss in that room and not to go in and say something like, "Congratulations, how's the baby?" This is the leaf with the teardrop that I'm talking about on the paper with my only set of Lily's prints (which I am sooo thankful to have). "The leaf with the teardrop reflects both intense suffering of loss and hope for the future. Though fallen, the leaf maintains its vitality, symbolizing hope. It cradles the teardrop with its upturned edges creating a sense of comfort. As seasons change, so do feelings. Just as there is winter and spring, there is sadness and hope." Here's another photo of what the box looks like on the inside. It is full of special items. I also included my blog link with many resources available, such as songs, books, movies, etc. I hope they will visit if they are looking for resources for their baby's memorial service or for comfort in the days ahead. 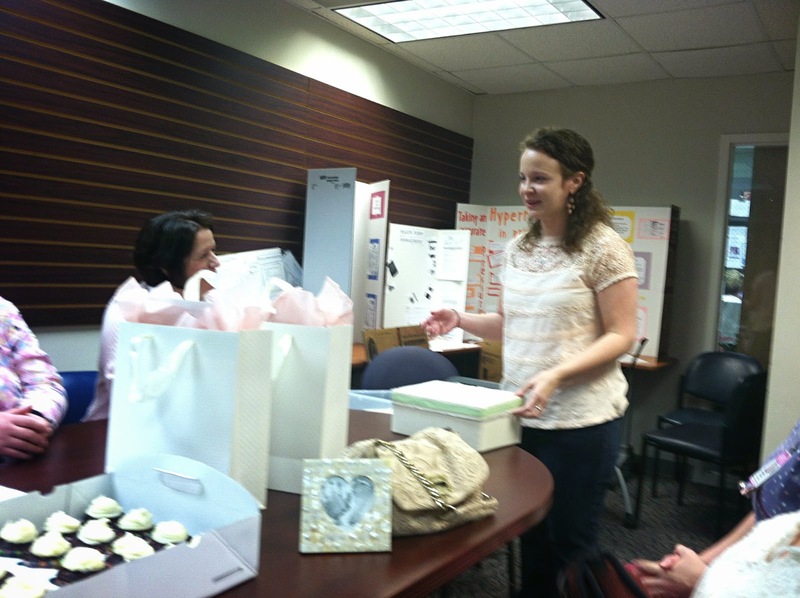 Here I am sharing the boxes at the hospital on Lily's birthday. 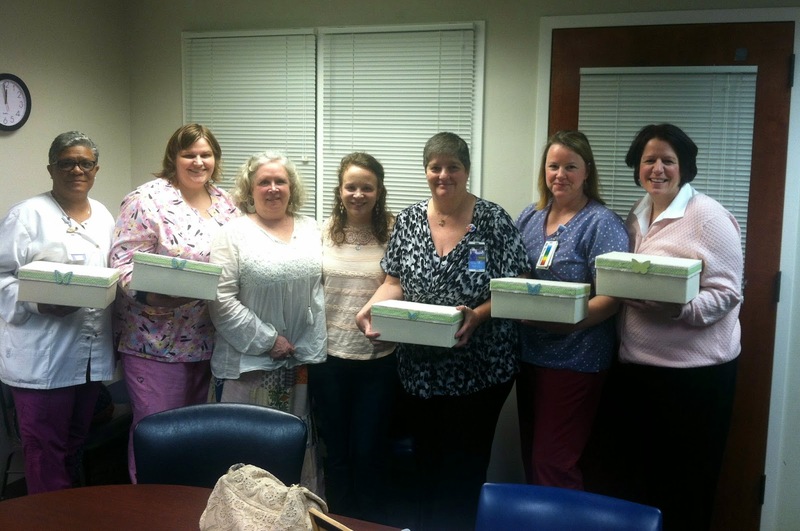 And here are my mom and I with the nurses and our boxes. You can see lots more photos from Lily's birthday and read more by clicking HERE. This has certainly been a long labor of love that has been finally brought to fruition. It was rather satisfying to finish and deliver the boxes. I prayed over each box, that God would put it into the hands of the people He desires to have it. It made me sad thinking about how long I've been working on these boxes and how the families who will one day be receiving them most likely have no idea that such boxes even exist, let alone that they will have the need of one. But God knows them and their baby and He wants to comfort them. I hope to comfort others with the comfort I have received (2 Corinthians 1:4). I can only do so much with my time and resources and honestly feel as if five boxes sadly only scratch the surface of this great need. However, when we are faithful with a little, God can do a lot! I'm just waiting to see what He will do next! I don't know if I will ever hear from the families who will receive these boxes, but I pray I will. I included my blog address, in hopes that they will come here and find more support and reach out. I hope they know their baby is cared about, even by me, a stranger. 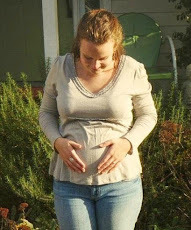 I hope this will be just the beginning of giving boxes to the Birth Center! Now that I know what I want in the boxes and have connections there, I pray the Lord would continue to open up the doors to serve families experiencing the loss of their precious baby. 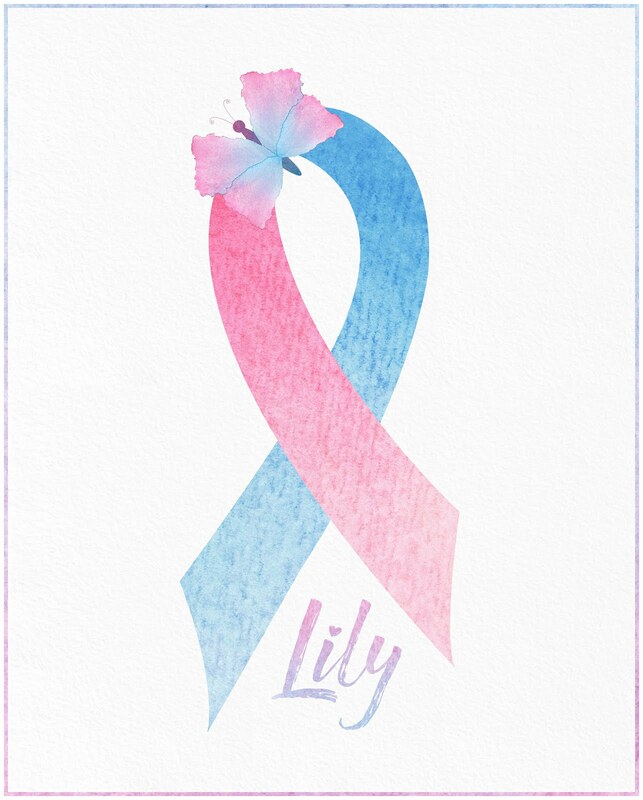 Lily's legacy continues to blossom here on Earth. I would love to do this! You have really planned it all out...how long does it take you to put together a box start to finish? Those are amazing! You did a wonderful job! This is absolutely amazing. And so beautiful. You did a great job. Aw they're beautiful. My Angels name is Lily also. Thank you, I wanted to do something but had no clue where to start! Those are beautiful! I've been wanting to put together some boxes in memory of Isabella! Are the boxes you used the photo boxes? You are awesome and Lily I'm sure is so proud of her momma! So thoughtful of you! I have a box and homemade blanket that was given to me at our hospital and it meant so much to me! What a Blessing during a heart wrenching time. When our Grandson was born into the arms of Jesus, the nurses put together a box for me Son and Daughter in love. Thank you for helping the families. I love these! The boxes are beautiful and so thoughtful.